Golden West is very competitive with their pricing. The team showed up and did a great job and the clean up was great. Wouldn’t hesitate to recommend them. This company provided excellent service. They came to the house to make some recommendations that were best for our house. They came promptly, when they said they would, and finished the job within the allotted time. After the job was all finished they cleaned up the site, and we only found a few nails in the yard. If there was an issue, they were very quick to take care of it. Fast and efficient service and I am very happy with the final product. Golden West Exteriors were very price competitive with my other quotes, but they were a lot easier to deal with than other contractors. From the time we started talking to job completed was two days! Work crew were young guys who were there to get the job done and didn’t waste time. Removal of old roofing was done with now damage to property, and clean-up was great. Very prompt service. Job was started and finished in one day, including site cleanup. I just purchased a home in the Edmonton area and needed to replace my rotting cedar shakes before the winter season. I contacted many suppliers for aggressive quotes and for the project to be completed within a certain time frame to suit my schedule. I found that many contractors required a DEPOSIT, were tough to get a hold of, and did not even return my calls. Golden West Exteriors gained my confidence when we met at my property to evaluate the roof. The estimator did this by quoting only on the minimal work which was needed in order to prolong the life of the existing roof a few more years. Other roofing companies wanted to replace the roof. Golden West Exteriors also noted an obvious issue which others roofers missed. This, along with Golden West Exterior’s solution, will prevent further problems with water from the roof damaging stucco. When the work was actually carried out, I was back in B.C. Communication by email and phone was great, and photos of the work done were sent to me. Golden West Exterior made every effort to ensure I was satisfied. I will be using Golden West Exteriors again when it is time to replace the roof!!! Fast, efficient and clean. Job was done well and they responded to all of my questions and small issues with the job. Golden west exteriors has excellent customer service. I contacted 5 roofing companies and the project manager phoned me within 10 minutes and came the next day to look at my roof. He was the only one who provided me with a quote on site, other companies said they would email me a quote the next day and I never received anything. The installers were polite and very clean. Golden west was also able to accommodate my short time frame request as I wanted the roof done before our second son is born. I would recommend golden west exteriors to anyone. 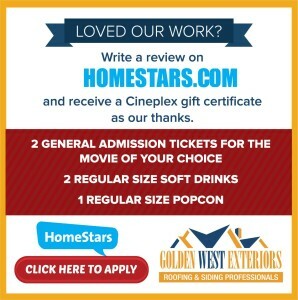 We were very impressed with the service received from Golden West Exteriors. They did the initial roof inspection for the Co-operators and it was determined that our roof had hail damage. Once we received their quotation from the Co-operators we decided to have Golden West do the work. The Co-operators contacted Golden West to have them contact us regarding the job. We were contacted the same day and we were given excellent service – the roof was scheduled to be done within three days of the initial contact with Cory Gardner of Golden West and was completed on schedule. Cory followed up with us immediately after the roof was completed. At all times Cory and his staff were informative, helpful and friendly. We love to hear feedback from our clients, if you would like to add a review for the service(s) Golden West Exteriors provided for you, click the image above. Clear and honest reviews can be an enormous benefit for other consumers researching potential contractors. Help them find the right contractor or avoid the bad ones by submitting your reviews today.